I was given this award by, Sherry at Edie Marie's Attic. It's the first award I have ever gotten. So, I'll place it on my blog on the side. Thanks Sherry. Two awards, WOW and WOW. 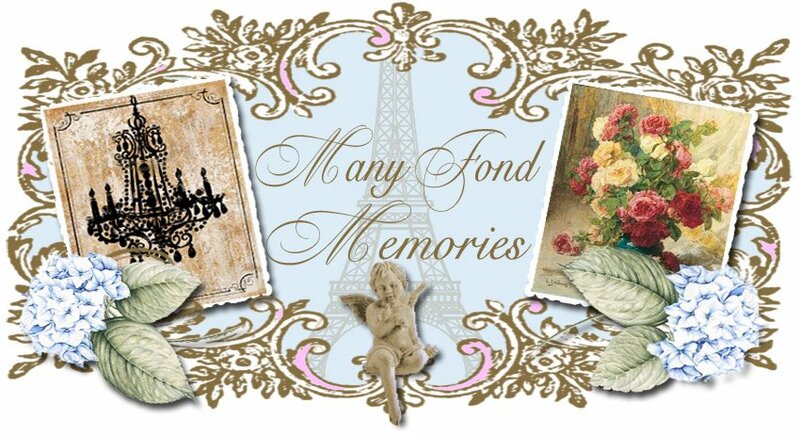 My second award came from Tracie , at My Petite Maison. Thank you to both of you, Sherry and Tracie for thinking of me. I drooled , over everything at this vendor. The pretty demitasse cups and saucers. And plate. I could not pass up the vase with the little cherubs. And the white basket from a vendor down the street. Everything I saw here I wanted. I would have been broke and no place to put it. And Cindy, at My Romantic Home I thought of you when I saw this mirror, and how it would look in your home with your other mirrors on the stairway. I will return again to Petaluma, and visit Summer Cottage. There were so many people there it was hard to see everything. And I am sure there are other antique stores there I didn't see. 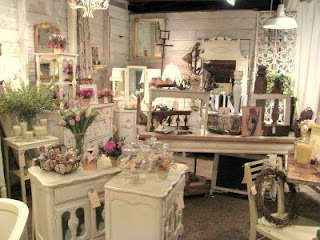 Now, I am looking forward to June, and going up to Healdsburg, and visit Mixing Whimsy's Barn Sale. (click photo's to enlarge). As far as the eye can see in both directions. Lots and lots of vendors. Inside Summer Cottage Vintage and Antiques. A petite chandelier and a pretty pink ribbon with floral hearts. This is such a cute saying on this homemade chalkboard. A nice summer setting for a day at the beach. The table underneath was a very nice shade of green, and time worn style. I thought this desk was so pretty. From a different vendor. Not Summer Cottage. Pretty white frames waiting for a home or a picture. All this was at the Petaluma Antiques Faire. There were so many vendors. It was Hot, at least 85 degrees. But I carried an umbrella and that helped a lot. It was great fun. My friend, Nancy went with me and we just loved seeing all the pretty and nice things for everyones taste. I have more photo's to share, but will post more tomorrow. (Click on pictures to enlarge). I decided my kitchen needed a new faucet. The old one just wasn't making me happy. I finally saw one on Overstock.com. It was a lot less expensive then the ones I had seen in the stores, so I decided to get this one. I needed a plumber to install it that was the down side. But I love that it is higher and makes it easy to get tall pots underneath it. It moves out of the way better so it leaves the sink open to do other things. All I needed to do other than, that was to put the caps on the open holes were the other faucet was and there you have it. I like it ! This was my new purchase today. It was the prettiest rose plant there was at Home Depot. I haven't really grow roses before, but could not pass up this beauty. The variations on the blooms are just so awesome. So, if any of you have any suggestions for me. I well take any and all suggestions in taking care of it. I will be planting this in a planter. An urn type. I will hate to see this beautiful plant die at my hands. I generally have good luck with plants in general. (click pictures to enlarge). This is my childhood Bride Doll. My mother had saved her for all those years. As my sister and I cleaned out our parents house back in 2007, we found many treasures that my mother had saved from our childhood. She's a little dirty and her dress needs cleaning and repairing, but she is still pretty. I remember my cousin being jealous of her and wanting her instead of the one she got. I have an old picture of her holding mine instead of hers but couldn't find it. She needs to find a place in our home, somewhere that the little doggy babies can't get her, they bark at her. (Click picture to enlarge). I had a great couple of days where I found some great little things. This little terrarium was found at an antique shop I almost missed it. And the Teapot I found at TJ Maxx for only $9.99. I like the black and white and the zebra's with the palm trees. The white vase was a great find for only $5.99 at Marshall's along with these 300 count pretty sheets. I just love old pictures and this came with it's original frame. And this little bench I found at Goodwill for only $4.99. It will make a great little place for plants. (Click on pictures to enlarge). I heard from Mixing Whimsy that they might have a May barn sale. I missed the last one and would love to go up there and check things out. I might get into big trouble. 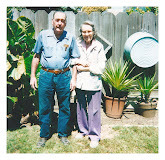 This is a photo from Mixing Whimsey's site. I know where I am going tomorrow. To Mixing Whimsy in Healdsburg, Ca. I discovered a few other bloggers where going and since it's only an hour and a half away, I figured why not go and check it out. Their web site is, Mixing Whimsy it is run by Cathleen and Molly. Their dates for when they are having their barn sale is on the the site. I can hardly wait to see what they have. It's going to be exciting. I might be able to meet a few fellow bloggers. Anyone want to tag along ? I had every intention of making it this weekend, but felt so out of sorts that I just didn't make it there. I am blaming menopause. I didn't sleep well, didn't get to sleep till 4 am Friday and Saturday and didn't feel good all weekend. But they are having another barn sale in june and I hope menopause does not turn it ugly head towards me again. Sorry to disappoint those who where looking forward to my adventure and photo's. 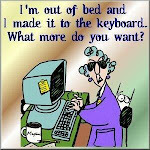 I am so through with this menopause thing. If anyone wants to tag along in June email me. I found these at Thrift Town in S.F. I can't pass by silver. It's an addiction. Now I just need to polish it. I know I'll find a nice place to display them. I just love the cake stand. This tablecloth I also found at the same store. I just love the detail. There is someone out there trying to send a VIRUS. They will leave a comment under either Kalar, or Krazilar. Do not open the comment or go to where they want you to see their comment. I have received this twice. I have a mac and we don't get viruses, but those of you without virus protection are their prey. Just wanted to give a heads up. I started getting it three days ago, after I turned off my verification with letters under comments. I don't know if that had anything to do with it. But I changed it back. So, be careful of opening what you don't know. A beautiful full bloom of a gardenia from my topiary. I've been tagged by Sherry, at Edie Marie's Attic . I am to give a 6 word meme that describes my life's motto. So, here I go. Family - I love my family, my sister and brother are all I have left of my immediate family. And my son. And for my friends in which I consider my extended family. Compassion - I want to take away the sadness or pain, and uplift and give hope. Love - It's what we all have and express in so many different ways, even if it's towards someone we don't know. Believe - In the thought of a better tomorrow. God - Without him we would not have any of the above. So, there I have done my 6. I don't know if I will pass it on. I don't know enough bloggers. My first thought is she saying, I just can't take another day of shopping. I found this at Home Goods and could not pass her up. There were two at the time and my friend Nancy got the other one, only in off white. She just seem to say it all.